If you have more cards in your Deck than your opponent does: Send cards from the top of your Deck to the Graveyard so you have the same number of cards in the Deck as your opponent. Definition of “game-changer” if there’s ever been one, That Grass Looks Greener was an absurdly unwelcome addition to the game in February (or welcome addition, depending on who you ask.) For a short time, it flooded the game with 60-card decks, an anomaly to an otherwise strictly 40-card per deck game. It was my #5 card of 2017. What was obvious to most players about this card was its “max effect” – that is, how many cards could this spell affect in one play? Well, when the answer for any card is 20, that’s usually the sign of a broken card, or at least a card with the potential to be broken eventually. When That Grass Looks Greener mills 20, you know it’s ridiculous no matter the deck. Now the OCG still has this card as unlimited while it’s restricted, for good reason, in the TCG. But it’s only a matter of time for the OCG. A card with a max effect of 20+ will always be abused eventually and usually within short time. While it’s almost useless as a restricted card, that doesn’t lessen the impact that it had on the game in 2017. Will it ever come back? I sincerely doubt it. Much like similar cards such as Painful Choice and Sixth Sense, cards with a wide net, especially when loading the graveyard, are impossible to ignore, especially when there is no cost. That Grass Looks Greener had a small, sweet ride, and it comes in at #9. That Grass Looks Greener made 50+ card decks a playable thing in the meta. This card was unlimited for a time, and that meant you could go into a tournament with 60 cards and have a legitimate chance of winning…and quick. You have more cards, play this and mill until your opponent and you have the same amount. This was an insanely quick way of getting stuff into the grave and getting those grave effects. The only drawback to this card was if you and your opponent had the same amount of cards from the start. If this card comes in the late game it may be a dead draw, but it still could be used as discard fodder. Now it is limited for the time being, and is still being played and making a difference. This card allowed for multiple cards from different archetypes to combine into a deck and function. 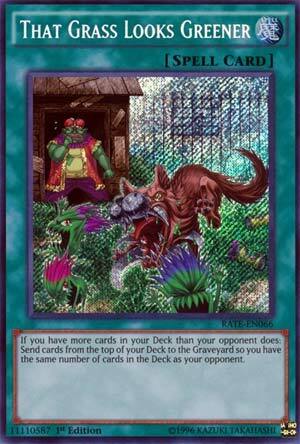 That Grass Looks Greener is a free Normal Spell Card that let’s you send cards from your Deck to the grave if your Main Deck has more cards in it than your opponent at the time of activation. Ideally, you want this at the start of the game with a 60 versus 40 card deck to mill the maximum number of cards. And in a perfect world, you want all of those sent cards to have an effect. The reason this card is so great is its usefulness in so many prominent decks. It in fact made those decks playable consistently at a high level. It effectively changed the game state for a while because opponent’s that did not run it would run more cards in the main deck to minimize the difference. Definitely a top ten worthy card for the year. The number 9 slot of the Top 10 is a card from the first Core Booster Set of 2017, Raging Tempest. Not the last time I will mention that set in this list. The card in reference is one of the most powerful Spell Cards I have seen in a while, That Grass Looks Greener. That Grass Looks Greener is a simple Spell Card where if you have more cards in your deck than your opponent, you can send cards from the top of the deck to the GY until your deck is the same size as the opponent’s. And just like that, 60 card decks became far more viable. There are several decks that like to mill: Zombies, Infernoids, Lightsworns, there are several decks I could list, and this card makes them mill with great ease if they are using a 60 card build. Sadly, this card is at 1, so it is less consistent in a 60 card deck now, but the card is still very powerful if you can use it early on in your 60 card deck and your opponent decided to deck thin heavily on their turn. The only real disadvantage is that as I mentioned, you have to use a 60 card deck, which can be inconsistent, but the power of this card makes them worth it.